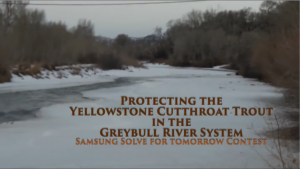 A Wyoming high school class is looking for your vote in getting the top spot in Samsung’s “Solve for Tomorrow” contest. These kids have designed an apparatus they’ve designed to reroute Yellowstone Cutthroat trout past irrigation dams and improve their chances of survival. Prizes for this contest are determined by which video gets the most votes, so click here to go cast your vote.